I just read an article in my foodie magazine that the Girl Scouts are preparing for their annual cookie sale brainwashing mess. It seem that every year, just when people start getting sick of their New Year's resolutions, they come out like cute little cockroaches (if there is such a thing) and convince us that we NEED some Samoas and Thin Mints. So, until then, we'll keep to our healthy diets...right?! Except for now, instead of having a goal of losing that last 9.8 of the 15 lbs. we put on during the holidays (and by we, I mean me), we'll just be good until the Girl Scouts come! Small, attainable goals, I always say! I love Paleo recipes with tons of flavor and this one was a hit with the whole fam. It's ready in 30 minutes, full of color and super filling! Fill a medium pot with salted water. Bring to a boil and add the sweet potato. Boil for about 10-12 minutes until soft enough to be pierced with a fork. Drain and set aside. While the sweet potatoes are boiling, spray a large skillet with olive oil cooking spray. Heat to medium heat and add the ground turkey, tomatoes, scallions and sweet peppers. Season with cumin, chili powder, paprika, garlic powder and about 1/2 tsp. each of salt and pepper. Stir until all ingredients are combined. Stir occasionally on medium heat and cook until the turkey is cooked through, about 7-10 minutes. 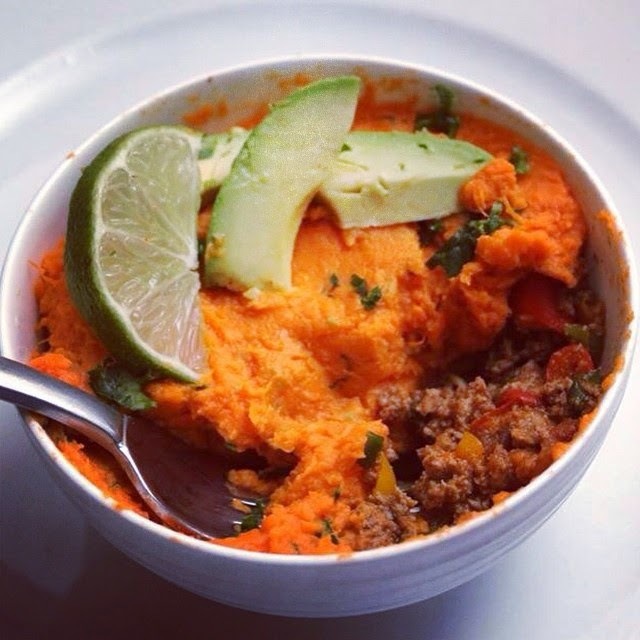 Transfer the sweet potatoes to a large mixing bowl after draining and add the lime juice and chopped cilantro. Season lightly with salt and pepper and use a potato masher or electric mixer to mash the sweet potatoes until light and fluffy. 4. Spoon the ground turkey mixture evenly into four small bowls or ramekins. 6. Top with avocado slices and extra cilantro bits.